the absolute jewel in the crown of the ottolenghi meal that i cooked at the weekend was the coriander and honey marinade that accompanied these lamb cutlets. it is an incredibly aromatic combination of parsley, mint and coriander with depth of flavour provided by garlic, ginger and chillies against a sweet and sour backdrop of lemon juice, red wine vinegar, soy sauce and honey. having marinated the lamb overnight, i bought the leftover marinade to the boil so we could have it as a “gravy” with the meat and it was truly delicious. this marinade would also work well as an uncooked sauce - spoon it over cooked meat, fish, seafood or something liked vegetable kebabs – and is really worth trying. this dish is my contribution to the grill it! edition of the monthly mingle, hosted by sig from live to eat. make sure most of the fat is trimmed off the lamb, leaving a uniform thin layer that will keep the meat moist and add to the flavour. 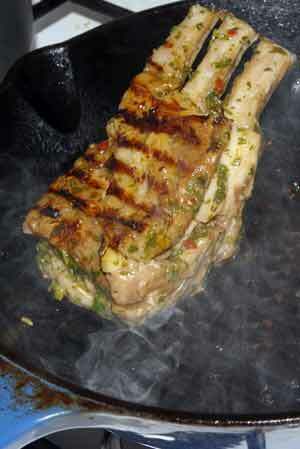 use a very sharp knife to separate the rack into portions of two or three cutlets. place in a non-metal container. blitz together all the remaining ingredients in a food processor, pour them over the lamb and make sure it is well covered for a night in the marinade. refrigerate overnight. preheat the oven to 200c and heat up a griddle pan. remove the meat from the marinade, shaking off the excess. sear well on all sides, about 5 minutes in total. transfer to a baking tray and cook in the oven for about15 minutes, depending on the size of the racks and how well cooked you want them.